There is a wonderful woman in my mom's ward who has been SO gracious to us! I was totally blown away when she sent my mom home with bags of clothes, blankets, and a bouncer swing. Well today, she gave us a CRIB!! It's BEAUTIFUL. It's a honey-colored solid wood crib that converts into a full sized bed when the kids are done with it. I LOVE IT! She also gave us an adorable bedding set and a few unopened packs of diapers! All of the bedding looks brand new, and smells so nice! Her little girl is 5 months old, and has outgrown a lot of their things, and they're giving them to me. I feel so blessed right now. Last Thursday, as we were pulling out of the complex, we were passed by that big beautiful brown delivery truck. We whipped around and sneakily followed him, and my suspicions were right - that wonderful man brought my books!!! I was so excited that I opened the box in the car on the way up to Rexburg and HAD to read my favorite Beatrix Potter story - The Tale of Two Bad Mice - to Steve as we drove. Oh HAPPY DAY! 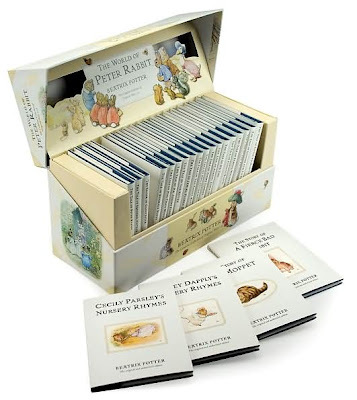 Beatrix Potter is in the mail!! The grass is turning green, and the snow doesn't stick anymore!! I've seen more tulips budding than I can count! I don't know why, but I didn't notice any of these spring-time miracles happening until today. I am SO excited! x Dr. Suess, of course! Tell me if you have any favorites that you would recommend so I can keep an eye out for them at yard sales! 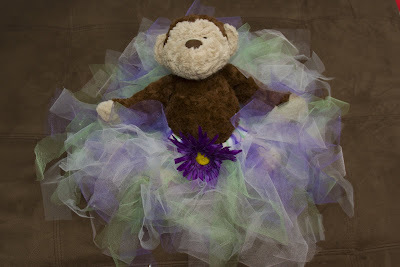 My good friend, Megan Shipton, made Addie this TUTU!! I think it is the cutest thing in the world, and I keep staring at it. I put it on her stuffed monkey to show an approximate size. I can't wait to take pictures of a fat little baby girl in this! Shirley Temple's In My Tummy! Today, something wonderfully adorable and definitely noteworthy took place. As I was lying in bed this morning, staring at my stomach and waiting for it to jump, I noticed that Adellyn kicks in a very rhythmic pattern. Upon closer inspection, I realized that she kicks, punches, twists and summersaults along with my heartbeat! PERFECTLY in rhythm with it-like she's dancing! First thing I imagined was a little singing & dancing Shirley Temple ... Cross your fingers! Hello everybody! I am usually TERRIBLE at keeping things like this updated, but I think the combination of me being bored and my little girl kicking me in the stomach reminds me constantly that I should try and share my joy with everyone I can! My sister, Aubrei, has offered to make Adellyn's blessing dress!!!!!!! This is the one that Steve and I fell in love with the second we saw it. Aubrei is going to make it in an Ecru color for me. I think that the off-white color along with the pattern will make for a very nice, vintage-looking heirloom some day! I just LOVE the dress! Along with the name, Adellyn, that reflects on and honors the name of my great great grandmother, I love that this design gives the sense of a family heritage. Thank you for EVERYTHING, Aubrei !!!! Well...First of all, it needs to be said that we have been blessed so much already!! Two of my mom's neighbors have been gracious enough to offer us TONS of gently used clothes, and baby bouncer seats, etc. i have about 4 garbage bags packed OVERFLOWING with the most adorable clothes from my big sister, Aubrei (THANK YOU, THANK YOU, THANK YOU, AUBS!!) Each little outfit is packed with wonderful memories from each of her 3 beautiful girls! That's right! We're having a Girl!! As my niece, McKadie would say, It's a GRILL!! This is our tentative announcement design that will have a couple changes made after she's born. I LOVE the way she's sleeping in this picture!! She has her hands under her cheek and her knees pulled up. She was such a cutie in the ultrasound! I'm working on getting more pictures up! We're pretty stuck on the name Adellyn ________ Young. (Middle name being held secret for a reason :) Adellyn is a take on my great great grandmother's name, Angeline Adeline Luddington Bush.